As we highlighted a few weeks back, Texas is on a new path to accelerating its clean, renewable energy economy. The opening of the Competitive Renewable Energy Zones (CREZ) now enables more West and Panhandle wind turbines to fuel the state’s major metropolises, and the completion of the project couldn’t come soon enough. A number of companies are looking to grow and invest in Texas, thanks to its plentiful, clean wind power. 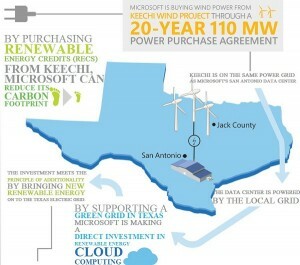 Google, Microsoft and BBVA Compass are leading the charge and signing long-term agreements to purchase Texas wind energy. These contracts lock in considerable revenue for the state and guarantee Texas’ ranking as the number one wind-producing state in the nation. In fact, West Texas wind has outpaced the growth of coal, natural gas and all other fuel sources that supply the grid, according to a recent report by the U.S. Energy Information Administration. In September, Google added to its growing stock of renewable energy by purchasing the entire output of a 240-megawatt wind farm (enough energy to power 84,000 homes) outside Amarillo to power its Oklahoma data center. 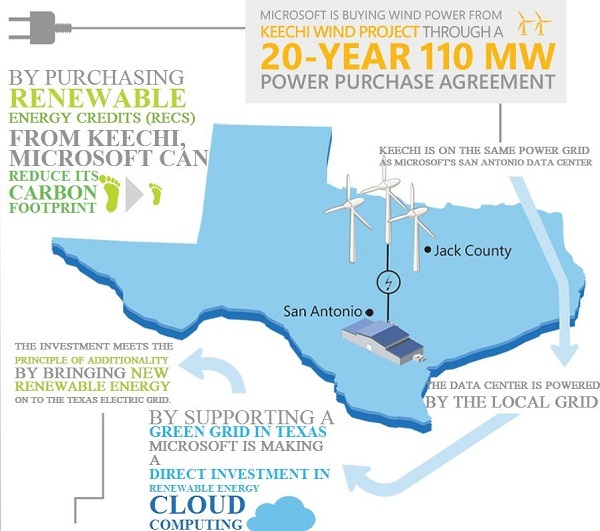 Late in November, Microsoft signed a 20-year contract to purchase all of the energy from a 110-megawatt wind farm outside Fort Worth to power its San Antonio data center. And BBVA Compass recently signed a 10-year agreement with Choice! Energy Services, a Houston-based retail energy broker, to power its Texas branches exclusively with wind and solar energy. So what’s attracting these companies to Texas wind energy? With the risks and realities of climate change becoming increasingly clear, more and more companies are moving to reduce or eliminate their carbon footprint by seeking cheap, water-free, carbon-free renewable energy. There is an economic upside as well. These long-term renewable energy contracts are popular because they provide absolute certainty about the price a company will pay for electricity for decades to come. Unlike electricity purchased from the utility, the price will not go up if, say, natural gas prices increase in the future. This makes the contracts an attractive option for businesses and the environment. EDF applauds these companies’ efforts to make the switch to clean energy. Their bulk purchase of homegrown, renewable electricity expands Texas’ wind industry, reduces harmful pollution and grows the state’s economy. Most importantly, it gets all of us a little closer to a clean energy economy that protects the climate and reduces our dependence on fossil fuels. It’s a clear win for everyone. 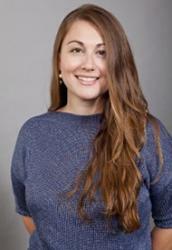 This entry was posted in Renewable Energy, Texas and tagged CREZ, Google. Bookmark the permalink. Both comments and trackbacks are currently closed.